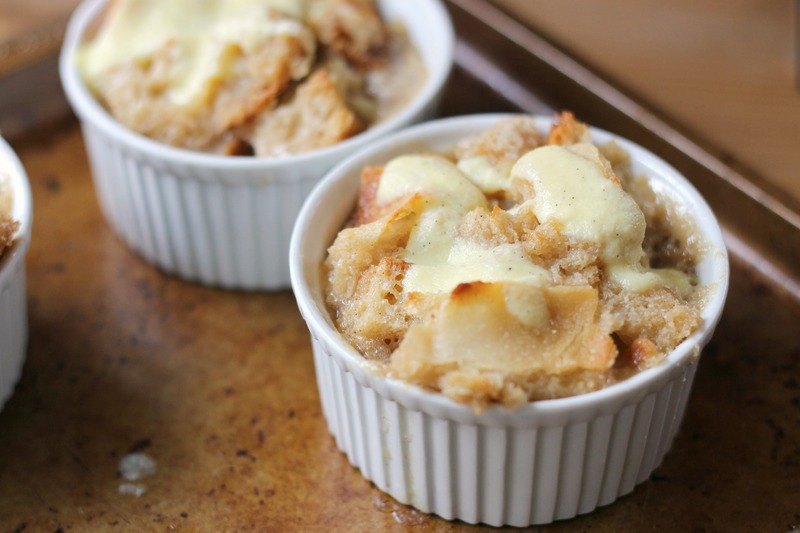 Bread pudding kind of seems like an unassuming dessert, kind of the ugly duckling of the dessert world. Sure, it’s not the prettiest of treats, but it’s such a homey dessert, with its warm spices and rustic appearance. And it actually tastes great too. A delicious slurry of brown sugar, vanilla, allspice, cinnamon, and eggs is poured over milk-soaked French bread. It’s baked until the top is crisp but the inside is still moist and fluffy. The already delicious pudding is then topped with a vanilla bean-speckled custard sauce. Completely delicious! This bread pudding is definitely a dessert, even though some bread puddings seem a little more breakfasty. It is really rich and sweet, which is never a bad thing. It’s great warm out of the oven, but the leftovers are great right out of the fridge too. By the way, we have six ramekins and filled them for individual portions. We baked the rest of the pudding in a thinner layer in a 9×13-inch pan. However, you can also bake all of it in the 9×13-inch pan, which is what we have in the instructions below. Preheat oven to 350°F. Put the bread and milk in a large bowl and mix until all of the milk is absorbed. You may need to add more bread if need be to help absorb all the milk. In a separate bowl, beat eggs, sugar, brown sugar, vanilla, cinnamon, and allspice together. Pour the mixture over the bread and stir to combine. Gently stir in the raisins if using. Pour butter into the bottom of a 9×13 inch baking pan. Coat the bottom and the sides of the pan with the butter. Pour in the bread mixture and bake for 40 minutes, or until the bread pudding is set and the corners are slightly browned. Let cool on a wire rack while you make the custard sauce. To make the vanilla custard sauce, heat the milk in a medium saucepan until boiling. Remove from heat and stir in the vanilla and rum extract. In a medium bowl, whisk together the sugar and egg yolks until combined and a light yellow color. Temper the egg yolks by whisking in a few tablespoons of the hot cream mixture, until you’ve added about half of the cream mixture. Pour the egg yolk mixture into the pan with the remaining cream mixture and stir over medium heat with a wooden spoon until the custard thickens (do not overcook or your egg yolks will scramble!). Remove from the heat. Strain if needed. 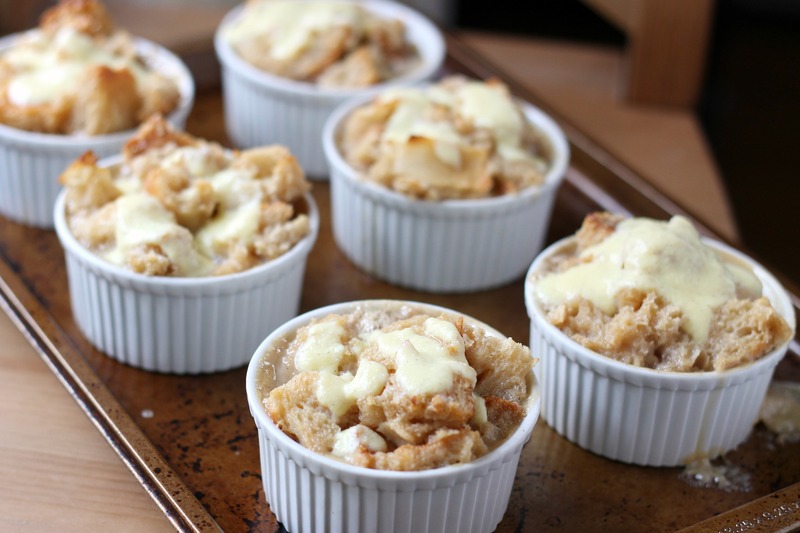 Cut the bread pudding into squares and drizzle vanilla custard sauce over each piece. Serve warm. Enjoy! Dear God I am drooling over everything on your blog. I think bread pudding is underrated and fantastic (despite being not very visually appealing!). And who doesn’t love custard? Love the sauce too! Thank you! I completely agree- it’s one of the best desserts out there. Maybe if it was prettier more people would like it!